People involved in the transportation industry often find better ways to do their jobs. Whether it’s a new gadget that improves the quality and safety of a project, or an innovative process that reduces costs and improves efficiency, the people on the front lines are often the source of the innovations that become the latest and best practices. New Jersey’s Build a Better Mousetrap Competition provides a great opportunity to share new ideas with others and across the country. We are looking for submissions from employees of local or state public agencies (municipalities, counties, parks commissions, NJ Department of Transportation, NJ Transit) that have developed new solutions to problems or found better ways of doing things. We will gather the best ideas from around the state and judge them using a 5-point rating system. The highest scoring entries will be entered into a Build a Better Mousetrap National competition. Click the Better Mousetrap Competition for more information including an entry form to share your innovation and get in the game! If you have something you think would qualify for this competition, submit your entry by July 1 (local agency) or August 15 (state agency). Scraper with the Bull Blade. Source: Gunnison County Public Works Dept. 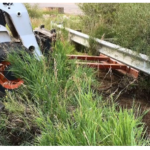 Modified Skid Steer removing debris from underneath guardrail. In Colorado, creating a culture of innovation lands the Gunnison County Public Works Department in the top spot for the Build a Better Mousetrap Award sponsored by the Federal Highway Administration’s Office of Innovative Program Delivery-Center for Local Aid Support. With an increase in guardrails throughout the county, the crews at the Department found themselves spending more time and money keeping guardrails clean from unwanted material and sand. 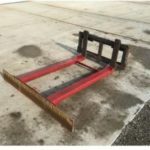 After considering several options, the Department crafted the Guardrail Reclaimer, which consisted of a bull blade and a scraper that fits over the forks of a skid steer. With this design, the Guardrail Reclaimer can adjust the blade and scraper to work with guardrails of various heights and post space widths. Gunnison County Public Works Department Director, Marlene Crosby says she is thrilled about her team placing first for the Build a Better Mousetrap Award! She says her approach to innovation is a nothing ventured, nothing gained approach. Some things will be successful, marginally successful or not so successful.” She encourages all agencies to look past the work of the employees and provide them with the tools and encouragement to come up with solutions to improve the work they do. A small solution solved a huge problem in Sioux County, Iowa, making them a second place winner in this year’s Build a Better Mousetrap Award sponsored by the Federal Highway Administration’s Office of Innovative Program Deliver Center for Local Aid Support. Members from the Sioux County Secondary Roads Department say they needed a better way to pull survey pins out of the roadways on paving projects. The process has always been to just bend over and pull the pins manually with a vise grip. This was considered back-breaking work because there was an average 3200 pins for an eight-mile paving project. The team began having discussions about how they can make improvements. After exchanging ideas and a little trial and error, the team came up with the Survey Pin Puller. A couple of hours of design and construction and less than a $100 investment, the team developed the award winning contraption that features a wheel, handle grips, some tubing, and other small materials. The device gives crew members more leverage to remove the stubborn pins easier and quicker. Equipment Operator Derek De Groot came up with the solution and says that he is very surprised at how well this worked! 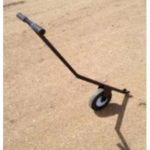 “We quickly threw it together and it has exceeded our expectations!” The Survey Pin Puller is now used on paving projects throughout Sioux County without causing physical ailments for the road crews. A desire to improve safety for a team of roadway repair workers created a winner in this year’s Build a Better Mousetrap third place award sponsored by the Federal Highway Administration’s Office of Innovative Program Delivery Center for Local Aid Support. The Polk County, Minnesota Asphalt Patch Trailer Crew needed safer ways to load and dispense tack oil used for roadway repairs. Their previous methods were unsafe for the workers and passing motorists. While working the roadways, the crew would often climb on top of a trailer tongue to access the propane fuel tank to reach the tack oil fill port. A wand used for dispensing the tack oil onto the pavement was another safety concern. The wand was too short, causing the truck to block traffic lanes making it difficult for passing motorists. The crew’s newest member came up with some ideas to improve safety for the crew and motorists. The innovations involved the design of a platform access stairway and development of a swinging boom. The stairway helps the team to climb to the top of the trailer to the tack oil fill cap. 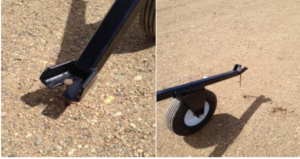 The swinging boom help to increase the reach of the tack oil wand, which would keep the truck and trailer from blocking lanes during its use. The swinging boom also prevented the excess hose from crossing the tack oil dispensing wand. This small change eliminated tripping and entanglement hazards for crew workers. With a total cost of $550 in equipment and 15 hours of manpower time, many benefits were produced such as: a reduction in injury risk to personnel, less operator fatigue, increased productivity on roadway repairs, faster repair time. As a result of making these changes the Polk County management identified that there was a decreased amount of time workers are exposed to hazards including oncoming traffic, and motorists can now pass the truck with the help of a flagging crew. Rich Sanders, Polk County Engineer is always encouraging his crew to be innovative in their thinking, “There is nothing wrong with trying, even if it does not succeed, you learn from it and keep trying.” Sanders says there are times you have to let them go and do what they need to do. He says he is absolutely thrilled that after years of watching others win, that he was able to receive a Build a Better Mousetrap Award this year!